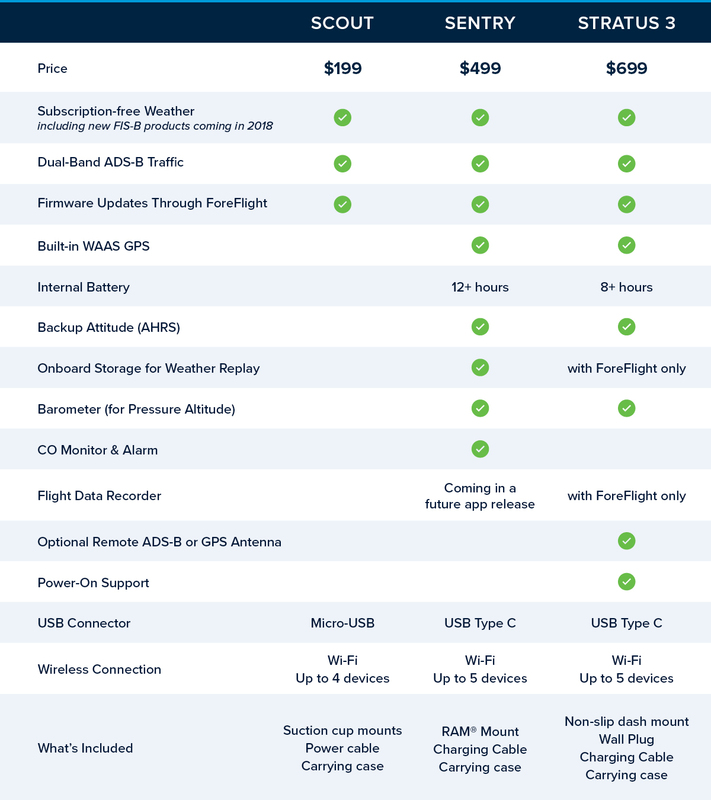 Helpful support information for the industry's smallest, most affordable off-the-shelf solution for receiving inflight ADS-B weather and traffic on ForeFlight. Scout is manufactured by uAvionix, an innovative avionics company based in Palo Alto, California. Is Scout a "dual-band" ADS-B receiver? Yes, Scout has dedicated internal antennas for both the 978 MHz and 1090 MHz frequency bands. What capabilities does Scout provide? Scout provides dual-band ADS-B In capabilities. With antennas for both the 978 MHz and 1090 MHz frequency bands, Scout enables the display of inflight weather and traffic on ForeFlight Mobile. Scout supports the full range of FIS-B weather and data, including animated regional and CONUS NEXRAD, METARs, TAFs, AIR/SIGMETs, PIREPs, winds and temps aloft, TFRs, NOTAMs, and SUA information. Scout can also receive air-to-air traffic information from ADS-B Out equipped aircraft and re-broadcast traffic information (ADS-R and TIS-B) from FAA ground towers. Keep in mind that if your aircraft is not equipped with ADS-B Out, then you will have a limited view of traffic on ForeFlight. For more information about how ADS-B traffic broadcasts work and who they are provided for, check out this article from Sporty's. Does Scout provide a weather replay capability? No, ForeFlight must be active for weather and traffic to be processed and stored for replay. Information received by Scout while ForeFlight is in the background will not be stored. Does Scout provide GPS data? No, Scout does not contain a GPS receiver and cannot provide GPS data to ForeFlight Mobile. Does Scout provide AHRS (backup attitude) capability? No, Scout does not contain an AHRS measurement device and cannot provide attitude information to ForeFlight. Does Scout have pressure altitude sensor? No, Scout does not have a pressure altitude sensor to display pressure altitude in ForeFlight. Does Scout include a flight data recorder? No, Scout does not include a flight data recorder and cannot be used to record Track Logs. Does Scout have an internal battery? No, Scout has no internal battery and requires an external power source. How do I power Scout? Scout uses a Micro-USB power connector and can be plugged into any 5V USB source including rechargeable USB batteries and cigarette lighter adapters. How much power does Scout use? Scout uses about 125 mA. What do the green lights on Scout mean? Scout has two green lights that indicate its power and reception status. One green light means that Scout is powered on but not receiving data from any ADS-B towers. Two green lights mean that Scout is receiving data from at least one ADS-B tower. Note that since Scout can also receive data directly from nearby ADS-B Out equipped aircraft, it is possible to receive some traffic data even if the second light is not on. What does the blue light near the bottom of Scout mean? The blue light is connected to Scout's Wi-Fi module, and will shine briefly when Scout is turned on, then blink faintly while Scout is connected to your iPad or iPhone via Wi-Fi. How big is Scout and how much does it weigh? Scout’s dimensions are 3.4in x 0.8in x 0.3in (85mm x 21mm x 8.5mm) and weighs 17 grams. Is Scout the same as the uAvionix pingBuddy 2? Scout is derived from the pingBuddy 2 and uses similar hardware, but Scout's tighter integration with ForeFlight enables performance improvements and convenient features like over-the-air firmware updates through ForeFlight Mobile. What apps does Scout work with? Scout works exclusively with ForeFlight Mobile version 9.2 and above. How do I connect to Scout in ForeFlight? Connect your iPad or iPhone to Scout’s Wi-Fi network in your device's Settings app. When you open ForeFlight Mobile, the app will immediately recognize Scout and start using the information it provides to display traffic and weather on the Maps view. ForeFlight Mobile must be running version 9.2 or above to work with Scout. How do I update Scout's firmware? You can update Scout's firmware directly through ForeFlight. Watch the video at the top of this page for step-by-step instructions. Is Scout available for fleet sales? We're not currently offering discounts on Scout for fleet sales. Who should I contact if I'm having problems with Scout? Please email team@foreflight.com if you encounter any problems while using Scout. What is your return and/or refund policy for Scout? Please email team@foreflight.com if you have questions about Scout returns and/or refunds. What warranty do you provide for Scout? Scout’s manufacturer, uAvionix, provides a one year warranty for defective units. You can read the full warranty here.